The perfect solution to a summer filled with family entertaining! If you're thinking about adding a table to your current furniture collection, then the Emily Table suits all garden shapes and sizes! Thinking about adding a table to your current furniture collection? The Emily Table is a comfortable width of 1.60m and suits all garden shapes and sizes. Additional Zest 4 Leisure products from the Emily Range are also available, including a Side Table, Chair or Bench. 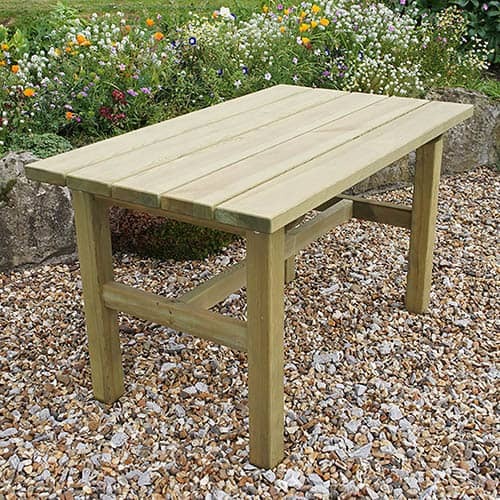 The Emily Table is manufactured from high quality, pressure treated, FSC® Certified timber to last longer, and comes with 10-year guarantee against rot so you can be sure that this product will last and remain to be a beautiful feature in your garden. Dimensions: 1.60m x 0.76m x 0.76m, assembly required - This product is 2-person assembly.